George E. Pellissier (probably born 16 October 1878, in Hadley, Hampshire, Massachusetts and probably died 22 September 1961 Montgomery, Hampden County, Massachusetts, USA) was an American civil engineer. He was the first American to use Thermite Welding commercially, when he successfully laid a 1 mile (1.6 km) rail track for the Holyoke Street Railway in Massachusetts. George E. Pellissier was first employed in 1897 by the Holyoke Street Railway in Massachusetts and served in its repair shop and the transportation department. In 1900 he entered Worcester Polytechnic Institute, where he graduated with the degree of Bachelor of Science in Civil Engineering. 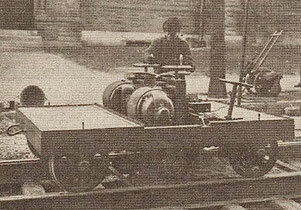 He then returned to the Holyoke Street Railway as Engineer of Maintenance of Way and Structures. As a student at Worcester Polytechnic Institute, he became interested in Thermite welding, a rail welding process invented in 1894 by Johannes Wilhelm „Hans“ Goldschmidt (born 18 January 1861 in Berlin, died 20 May 1923 in Baden-Baden). Pellissier followed Goldschmidt's work closely and proposed to the Holyoke Street Railway that they should use the new thermite process for their own lines. Following that recommendation, the railway ordered 160 joints to be produced on an approximately one mile long section of rail track on Main Street. 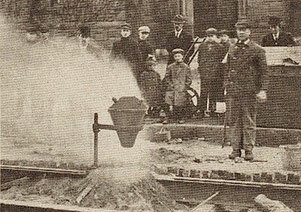 On 8 August 1904 Holyoke became the first rail line in the United States to lay track with the thermite process. Pellissier presented on 27 January 1905 a paper on thermit welding to the Civil Engineers' Society of the Worcester Polytechnic Institute. 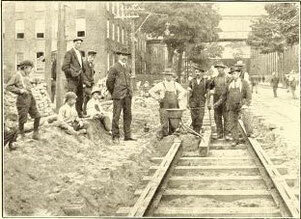 When the thermit process was introduced in the United States the Holyoke Street Railway Company decided to try it on a mile of track which was about to be reconstructed, and accordingly an order for 160 joints was placed with the Goldschmidt Thermit Company and preparations made to do the work. All of the apparatus except the crucibles was made at the company's shops, by its own men, the molds being manufactured at the power house and dried ontop of the boilers. Later, however, some of the molds were made at a local foundry, as the facilities for drying them in the manner described were not sufficient to keep pace with the work. 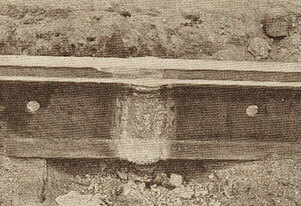 The welding commenced on 8 August 1904. 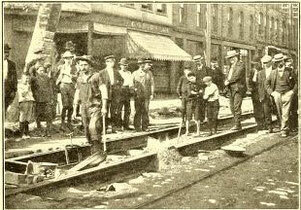 The section welded consisted of 1 mile of single track on Main Street, Holyoke. The rails were of the 9 inch (229 mm) grooved girder type, the section being similar to that used by the New York City Railway Company. The rails were laid on kyanized ties placed 28 inchs (711 mm) on centers, with white sand as a foundation, the same material being used also to fill in between the ties. No tie-rods were used, malleable cast-iron braces placed on every third tie taking their place and interfering less with the paving. The Joints were suspended. The track was first laid, spiked and brought approximately to line of grade, the joints being made temporarily with fish-plates, one bolt in each end sufficing to hold the rail in position until the welding gang came along. This gang was composed of three or four of the company's workmen, who did the work under Mr. Pellissier's supervision. One man removed the fish-plates, cleaned the sand off the rails with a wire brush, dried them off with the torch and removed the molds from the joints already made. The other two brought the ends of the rail into exact alignment, put on the molds, banked them up with sand and poured the joint. Where the entire section of the rail was welded, the top of the rail was also painted with a thin paste of clay and water, which, when dry, prevented the slag and iron from adhering to the top of the rail. It has been found, sufficient, however, to weld only the base and web of the rail. From eight to fifteen joints were made a day, the smaller number being due to the fact that the laying gang could not put down more rails on some days, particularly when special work was being put in. All joints were welded except those around the special work, it not being deemed advisable to do this around the latter on account of the difficulty of making the repairs or renewals in case of the breaking of a frog or switch. The work, with the exception of the paving, was practically completed in eighteen days, and was the first piece of track in the United States laid with thermit (sic) joints. Two joints were faulty and had to be repoured. This occurred while the work was in progress, and Mr. Pellissier believed that it was due more to the "innate cussedness of inanimate objects" than to any fault of the process or awkwardness on the part of the workmen, as about 100 joints had already been successfully poured. No breaks have occurred since the completion of the work, although the welding was done in August. With the experience obtained and a little better equipment for making the molds on a larger scale, it was believed that the molds could have been made for considerably less than the sum mentioned. The flasks used in Holyoke for this work cost $1.50 each and were made of sheet iron. This material was preferred to cast iron, despite its higher cost, on account of the rough usage to which the flasks were subjected by the track men. Tests of the joint with a Conant bond tester showed that the conductivity of the joint was equal to that of any other part of the rail. Mechanically the joints seemed to be perfect. To determine this quality, Mr. Pellissier subjected a sample joint to the following test: A section of rail 13 foot (3.96 m) long, with the joint in the middle, was placed in the track on two ties, distant center to center of bearing, 12 foot 6 inches (3.81 m), and three loaded double-truck cars weighing about 20 tons each allowed to pass over it. The joint suffered no harm, but a crack developed between two bolt holes. The rail was then taken out and broken; the fracture extended from the top of the joint, where the rail was not welded, diagonally through the bolt holes to a point on the face of the rail about 6 inches (152 mm) from the joint. A chemical analysis of the joint metal indicated that it compared very favorably with the ordinary steel rail in toughness and ductility. None of the joints put in during fall 1904 has failed until January 1905, although the temperature has been as low as -10° F (-23° C), while the welding was done when the temperature was 80°-90° F (27°-32° C) in the shade. Although it is not anticipated that they would have passed through the first winter without a single break, nor that perfection has been attained in the first attempt on an entirely new kind of work, it was thought that the percentage of breaks would be so small as to be negligible. From what experience Mr. Pellissier has had with this joint and from reports he has received from other sources, it seemed to him that it came nearer to fulfilling the requirements of street railway service than any other heretofore used, and that it is destined to occupy a very prominent place in permanent way construction in the future. Mr. Pellissier said that, granting the results obtained were not superior to those secured from electric or cast welding (which he would hardly admit), the lack of expensive apparatus, the simplicity of the process and its adaptability to repairs and construction on moderate-sized systems were bound to give it a commanding position. In conclusion, some interesting figures were given in regard to the saving which the continuous rail represented. Assuming the additional life of track to be five years, which experience has proven to be a low estimate, this item alone represented between $5,000 and $10,000 per mile (€2,760 and €5,520 per km) of single track. Next, taking the loss of energy due to a poor return circuit, figures were quoted by Mr. Pellissier from Dr. Louis Bell's "Power Distribution for Electric Railroads," from which it is shown that assuming a 90 lb. per yard (45 kg/m) rail with an average of 90 amps, flow and bond resistances of .002 ohms each represents about $500 per mile (€276 per km) of single track per year, and this represented not at all an extremely bad case, but a very common one. When, in addition to this, the saving in car repairs and the additional comfort to passengers was considered, the value of a process of this kind may readily be seen. Mr. Pellissier remarked that he had said nothing about electrolysis damages for which his company had not yet been obliged to pay, but he felt that the day was coming when city railways would have to give more attention to that phase of the subject. Pellissier was not only Goldschmidt's first American customer, but from 1906 until 1912 he became engineer and superintendent for the Goldschmidt Thermit Company, New York, where he got involved in developing the Thermit (sic) process particularly as applied to electric railways. In connection with this work he made inspections of electric railways in many large cities of the United States and Europe. From 1912 to 1917 he was engaged in a private consulting engineering practice in Springfield, Massachusetts. During this time he worked on the design and construction of power houses, carhouses and industrial buildings, bridges, etc., for electric railways and municipalities with a cumulative value of approximately $2,000,000. From 1913 to 1917 George Pellissier was a consulting engineer for the Holyoke Street Railway in charge of the design and reconstruction of its power houses, carhouses and other buildings. 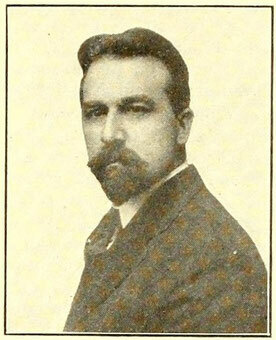 He became assistant general manager of the Holyoke Street Railway in October 1917. He was a member of the American Society of Civil Engineers and the American Society of Mechanical Engineers. George E. Pellisier, Electric Railway Journal, Vol 50, No 16, 20 October 1917, p. 742. Retrieved on 1 December 2018. George Edward Pellissier. On: Find a Grave. Retrieved on 1 December 2018. F. Haber: Hans Goldschmidt. In: Berichte der Deutschen Chemischen Gesellschaft. Band 56, Nr. 8, 1923, S. A77–A79, doi:10.1002/cber.19230560867. Retrieved on 1 December 2018. Hans Goldschmidt: Ueber ein neues Verfahren zur Darstellung von Metallen und Legirungen mittelst Aluminiums. In: Justus Liebigs Annalen der Chemie. Band 301, Nr. 1, 1898, S. 19–28, doi:10.1002/jlac.18983010103. Retrieved on 1 December 2018. Simtropolitan: Holyoke Street Railway. Published on Wikipedia under a Creative Commons Licence (CC-BY-SA 3.0) on 15 October 2018 – 9 November 2018. Retrieved on 1 December 2018. Street Railway Journal, Vol 25, No 7, 18 February 1905, p. 317. Retrieved on 1 December 2018. Leonard J. 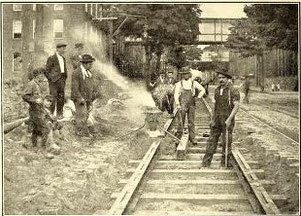 Los: Holyoke History - Welding on HSR Trolley Line 1910 . 10 April 2014. Retrieved on 1 December 2018. New Thermit Joints at Holyoke. Electric Railway Journal, 3 December 1910, p. 1119. Retrieved on 1 December 2018.